A dervish. 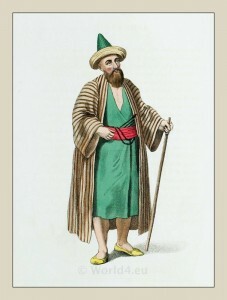 Traditional sufi costume. Ottoman empire. Home » A dervish. Traditional sufi costume. Ottoman empire. A dervish of the Ottoman empire. 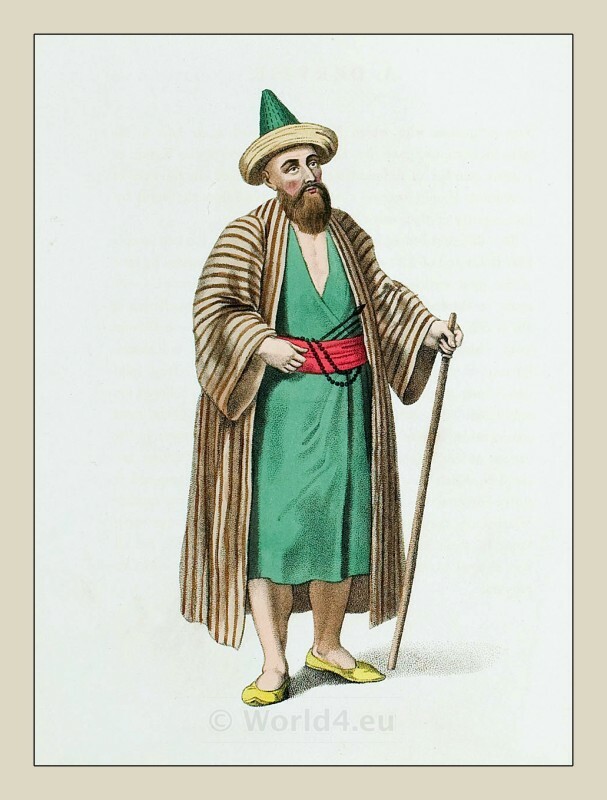 Traditional sufi costume. THE enthusiasm with which Mahomet so well knew how to inspire his disciples, gave rise, among the believers of the Koran, to a great number of different sects, each of which, in the eyes of a credulous people, seemed absolutely detached from the world by the austerity of their way of life. The different orders of Dervishes (Sufi) originated in the two sects of Ebu Bekir and of Ali; and they were all probably founded by men of the most enthusiastic or ambitious minds. Each gave his own name to the sect he formed, adding at the time the appellation of Pir or Schiek. Their followers took the name of Dervishes, a Persian word, which means the sill or threshold of a door, and thence inferred a mind filled with humility, desirous of retreat, and persevering in practice; a character for which these anchorets are celebrated. The number of these societies, or at least of the most considerable, is now about thirty-two; and the difference in the various orders extends even to their dress. The Dervishes use chaplets, which they hold as sacred. Each of these is composed of thirty-three, sixty-six, and ninety-nine beads, which is the number of attributes they ascribe to the Deity. Some orders always carry them in their hands: others attach them to their girdles, but all are obliged to use them many times a day with the particular prayers. This entry was posted in 1804, 19th Century, Ecclesiastical, Ottoman Empire, Turkey Costumes and tagged Ecclesiastical Dress, Octavian Dalvimart, Ottoman Empire costumes, The costume of Turkey on 3/2/13 by world4.